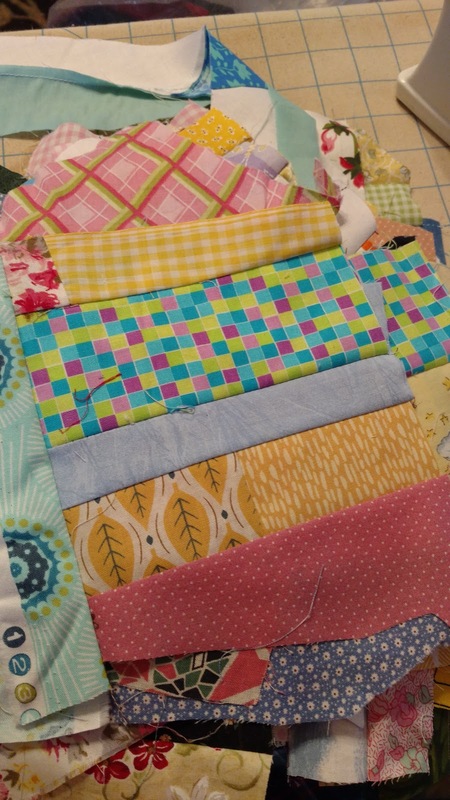 Cactus patch was the first quilt I wanted to make in Bonnie Hunter's first book scraps and shirttails. 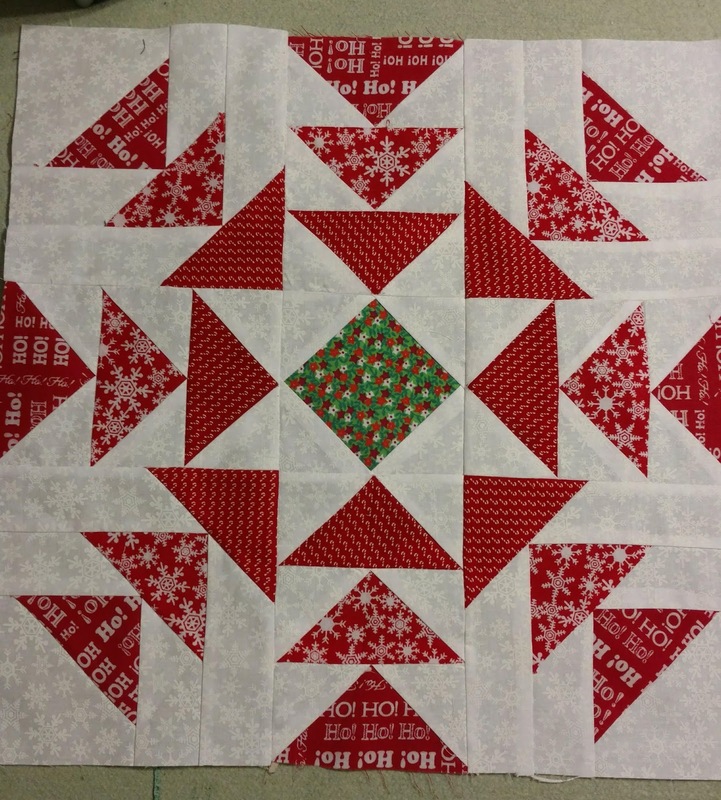 I really liked the half blocks and how the half square triangles are a little wonky. 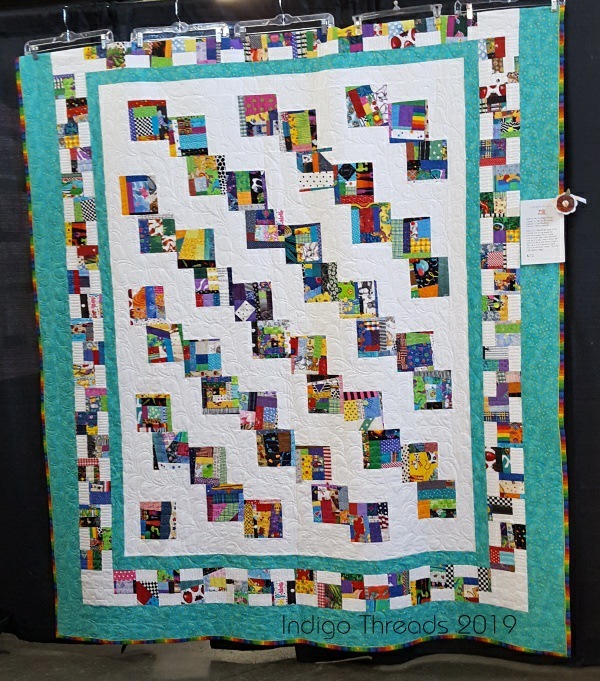 The centers for each block are crumb blocks, and the colors were bright. I already had a growing pile of crumb blocks, and, was excited for the idea on how to use them. I worked on it, off and on, for awhile, and then, it disappeared into the ufo void. The ufo void must be a fascinating place. Recently, my computer mouse and I have been at odds. I think I am in charge, and he thinks otherwise. I have a little finger tremble, and I am going places I didn't plan. Recently, I deleted comments unintentionally. The delete button is right next to the publish button, and I am thinking publish, and, the stupid mouse is thinking go further to the delete button. I am so sorry and sad. Is there a way to get them back on blogger. sigh..... Oh and the keyboard thinks I can't spell. 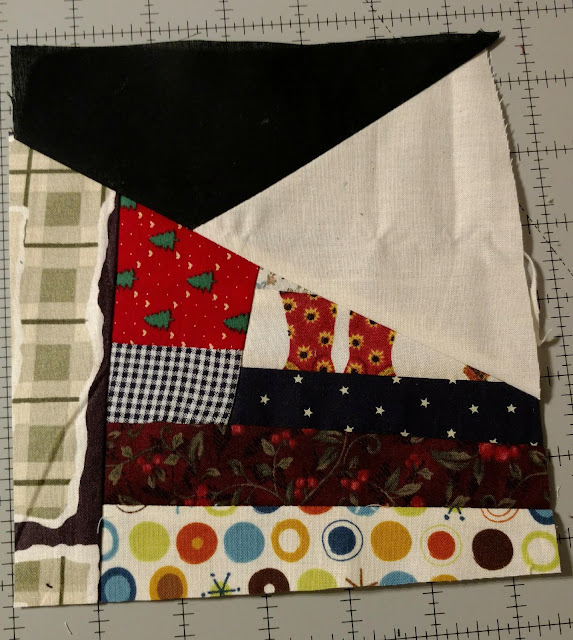 January 350 block challenge progress from Books, Hooks, Sticks, etc. Ok then, we have the first month of 2019 in the bag! 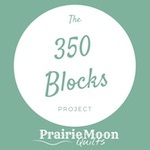 As I have mentioned before, I have participated in the 350 Block Project for a couple of years but I think January was the best month I have had in a long time. Which is now completely bound and being mailed to its new home in California. Which, hopefully, has been received in Canada by now. 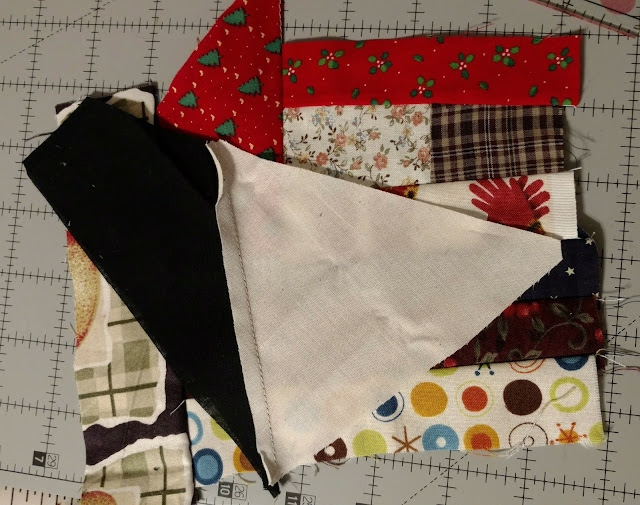 I have been making progress on several quilts, but no noteworthy pictures, that don't look like several pictures I have already posted. I did finish clue 3 of good fortune but will post that on Monday with the link up at Quiltville. 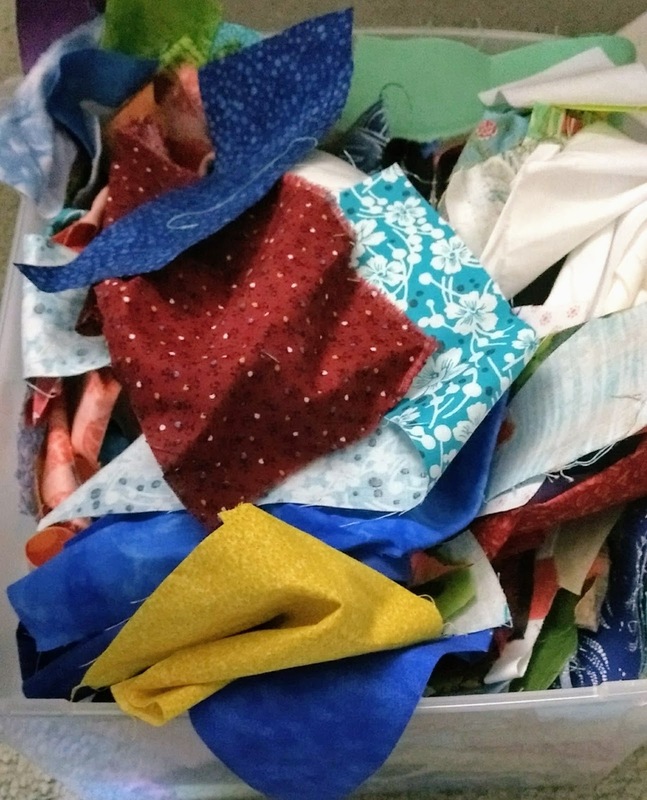 I did some mindless string and crumb piecing last night, mostly to clean up a mess. I string piece on a treadle in my living room, and it's time to make it a little more holiday worthy. But there were some strings hanging out on the cabinet that I could just play strings. I had one more idea to try with the scrap crazy 6 template set. I used a 3 inch strip in color, and a 3 inch strip of background. I sewed them together, and used the markings on the template to center it, and cut. It takes almost a whole wof strip to have 6 cuts of the same fabric. But, it is a cute block. 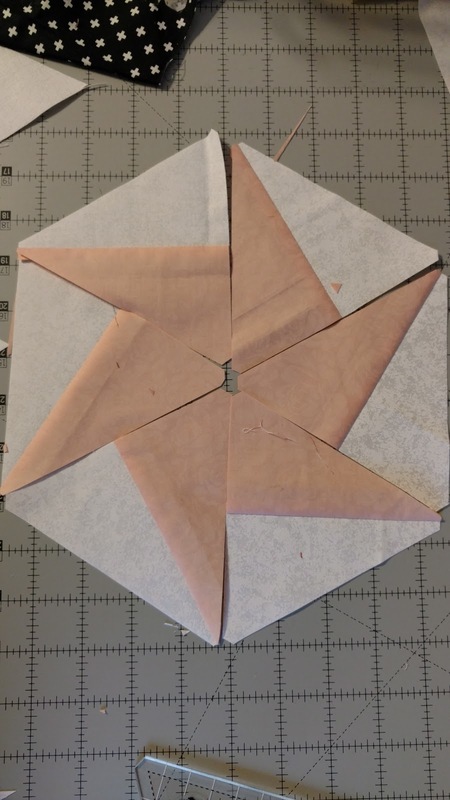 I had a quilt that I had seen online that I wanted to see if I could use the scrap crazy 6 templates to make. I really like the way this has black pinwheels. 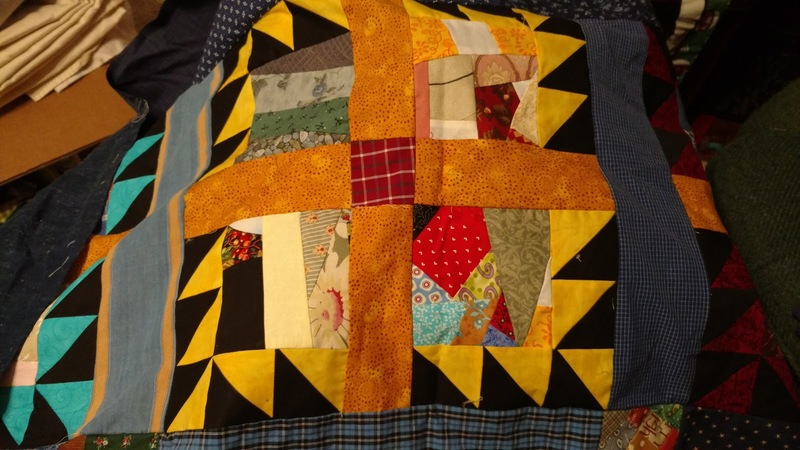 I guess what I am trying to understand is how to do it like the quilt I found online with a square in the center of scraps. Mine has another pinwheel. Which I like, but wonder why it isn't the same. I am sure I will hang my head when I find the easy solution. 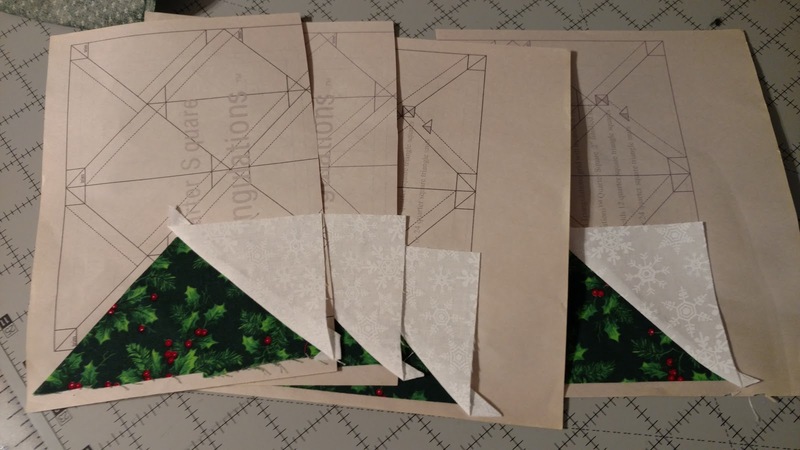 Using the scrap crazy 6 templates has been fun. 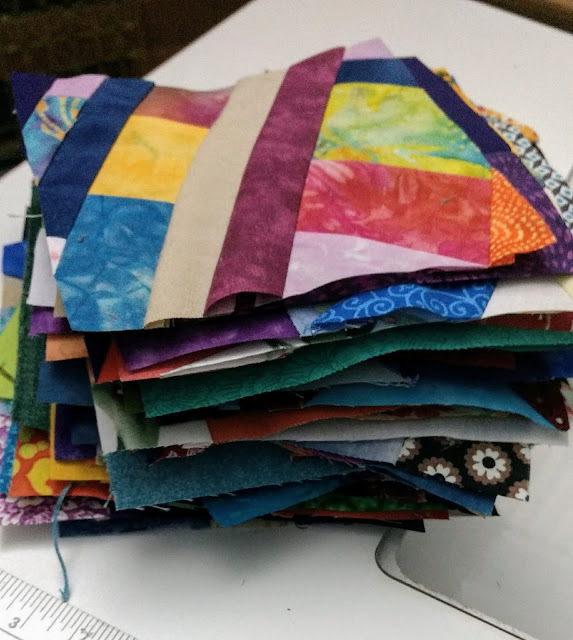 I haven't finished anything, but I have learned a bit about color choices. I am not of fan of the oriental look. 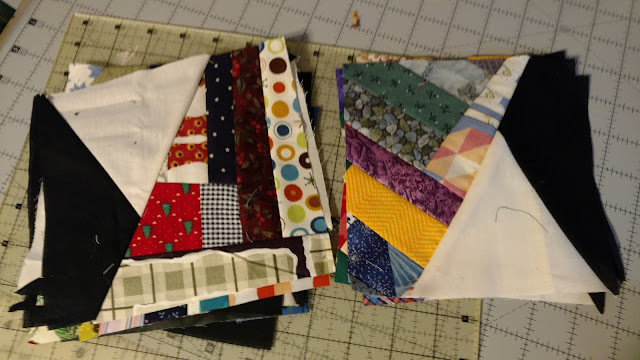 I have really enjoyed sewing these together. 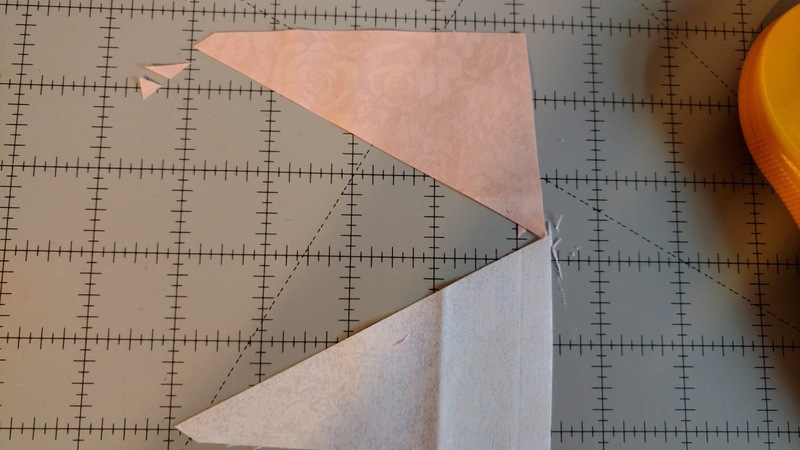 I am sure there is a smart way to cut the scrappy triangle but I am just using squares that I have constructed from scraps and then making sure it is big enough to cut a 6 1/2 inch square. I can get both these variations using one square. 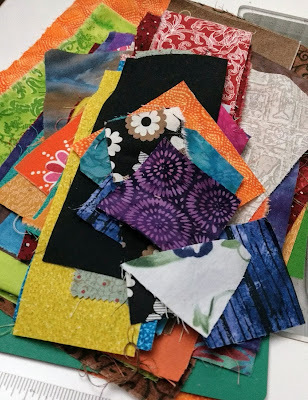 I have several already made blocks of strings and crumbs to play with in experimenting with a scrappy version quilt using the crazy 6 template set. 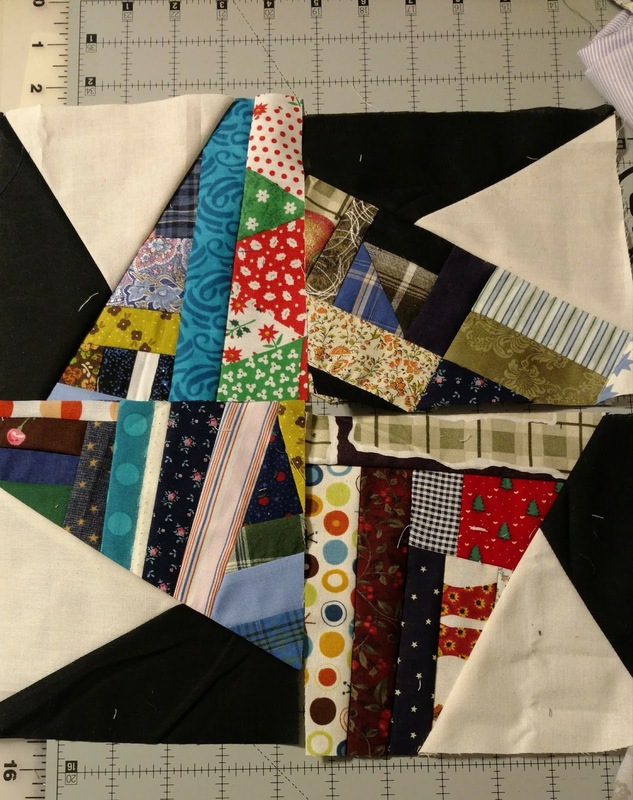 I tried to visualize a square block and pick a diagonal to sew the black and white piece. I am trimming to 6 1/2 inches using the black and white section as the cornerstone. 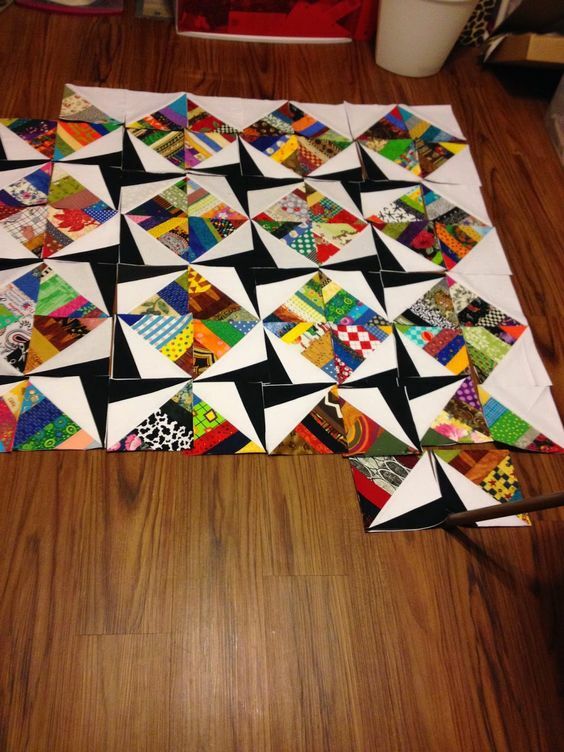 How I started this quilt is here and here and here. and here and here and here. 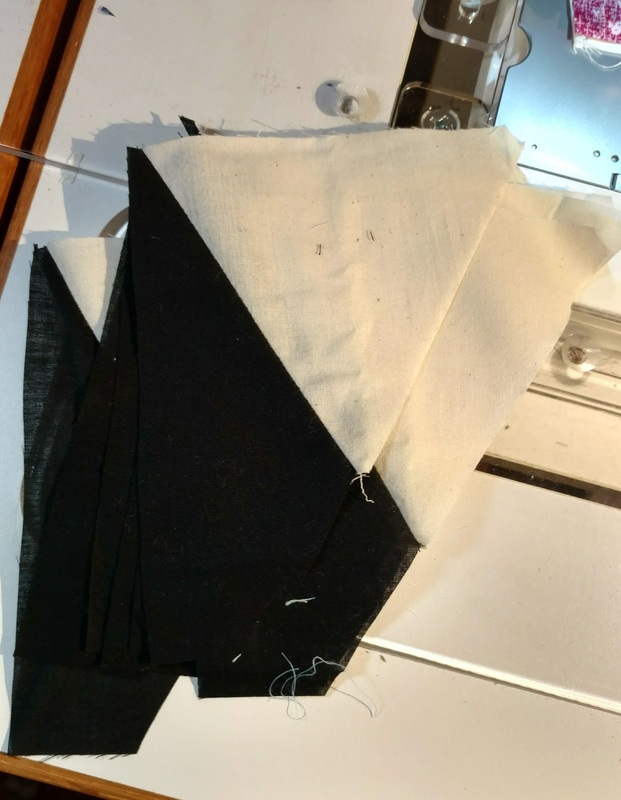 Last week, I cut the black and white pieces for a new experimental quilt.. I am using the crazy 6 template. 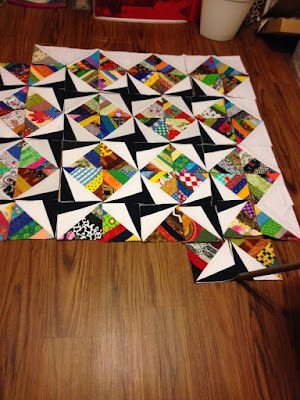 I have started the chain piecing. But, I am only sewing a few every morning before I work on other UFOs. I have another snowflake block finished which leaves only one left to do. 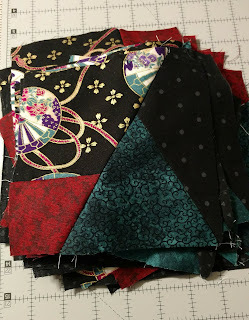 I am trying to finish these as I am planning to teach this quilt to our guild the early part of next year. I am playing around with a new to use template called crazy 6. I am ready to experiment with a scrappy version. 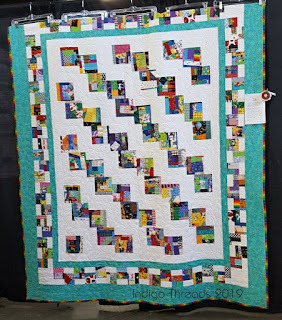 I saw this quilt by bquiltin here. 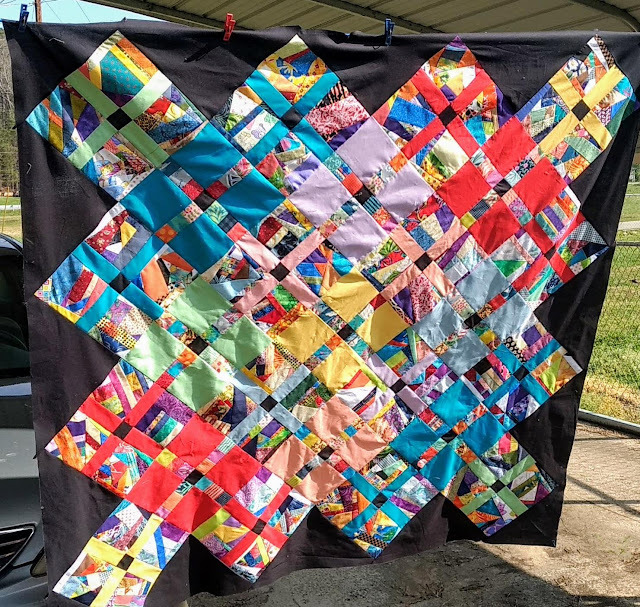 This is just an inspiration quilt. I didn't make it. which led to the pattern here. 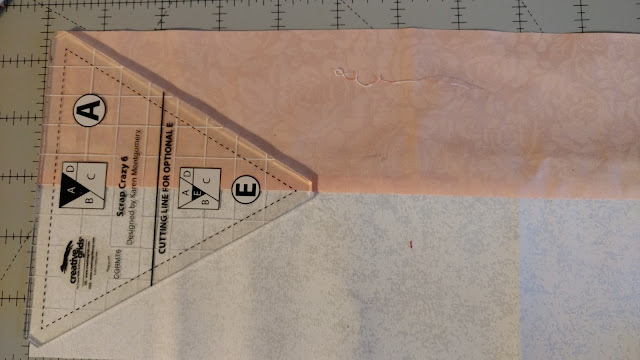 I thought I saw the crazy 6 template shapes in it and so I am going to try and see if I can get something close to that look, using the templates. 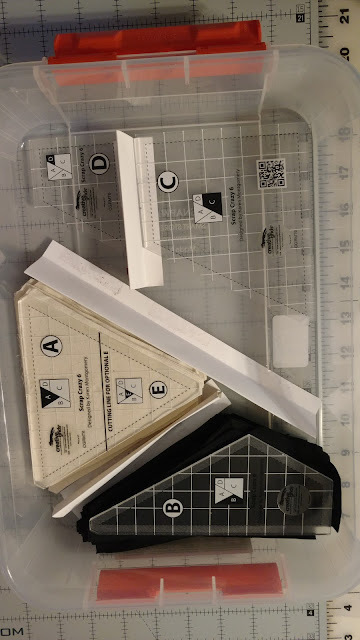 I cut cream for the A piece and black for the B piece. 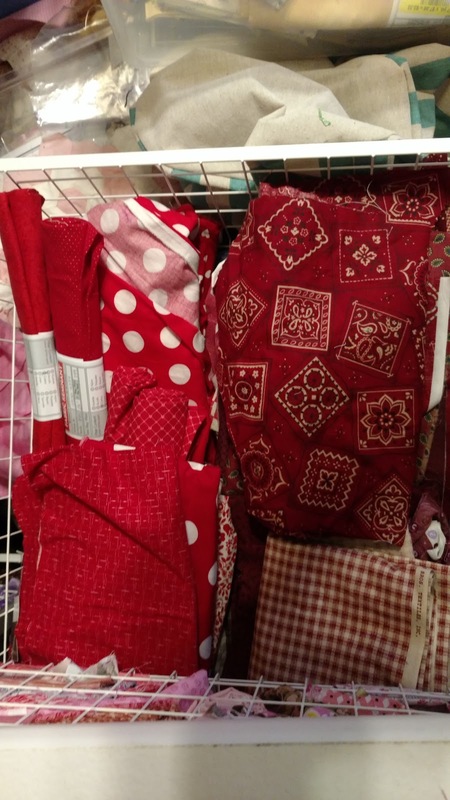 July OMG (One Monthly Goal) end of month report from Books, Hooks, Sticks, etc. Well, here we are at the end of another month. . . .it seems like there was no time for much this month. . . .but I did get some finished items. . . . just not what I had thought I would get done. First, I must apologize, there are no pictures as of this moment. I can't find the camera, again and some of the pictures are on the iPad, which I cannot access at the moment. So, you will need to come back to this post tomorrow to see the items I am writing about. 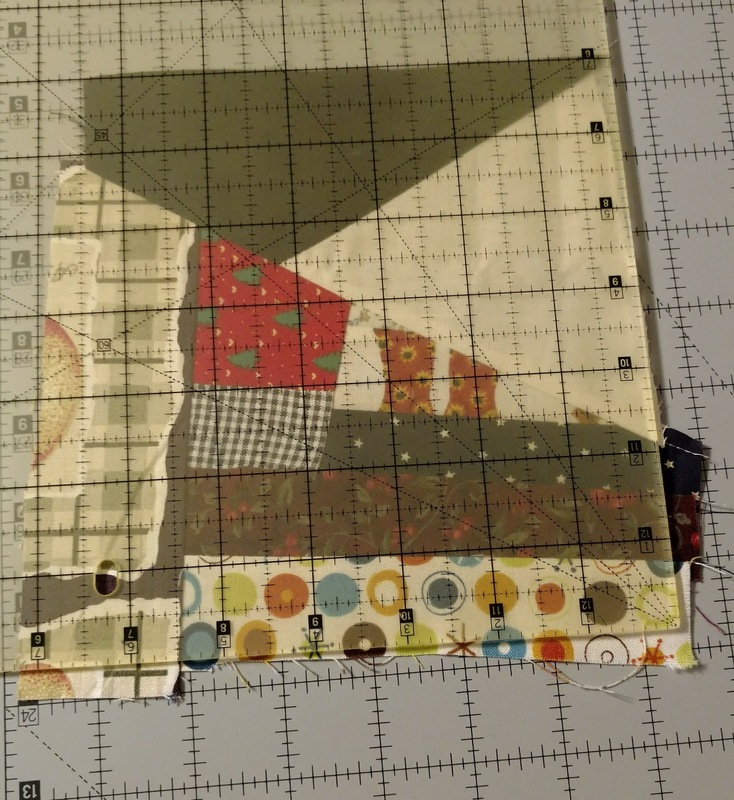 July OMG goal from Books, Hooks, Sticks, etc. Due to travelling in June I was not able to link up for the OMG (One Monthly Goal) program. . . but I am back for July and getting back to sewing. Now, my goal for July is to get crumby. . . . . as in crumb blocks. 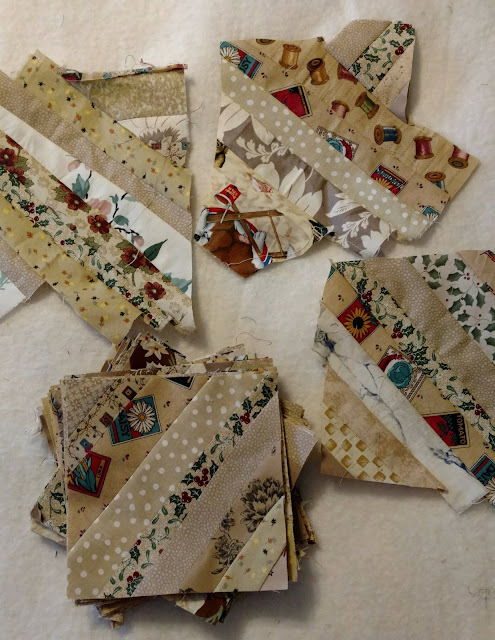 I want to have 42 of them done and ready for sashing. 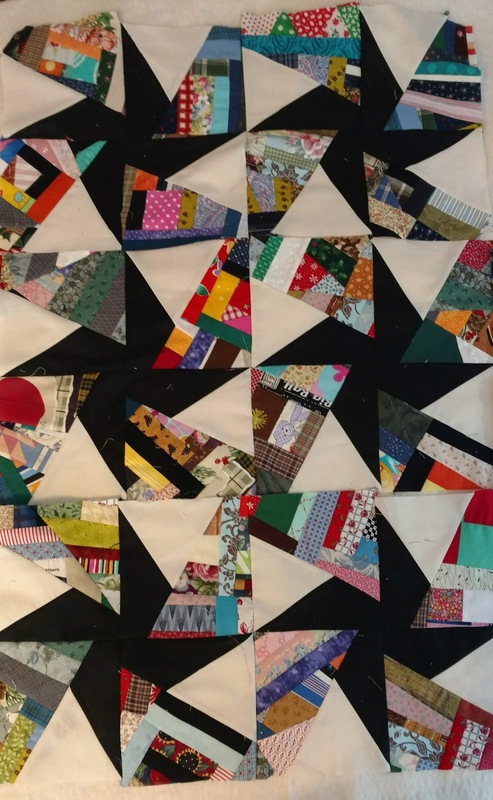 It took a lot of pinning and sewing and refilling a bobbin - they always seem run out on a long seam - but the Crumb Quilt top is complete. After pressing the last seam, I took it outside to hang in the sun for a photoshoot. Of course there was wind.